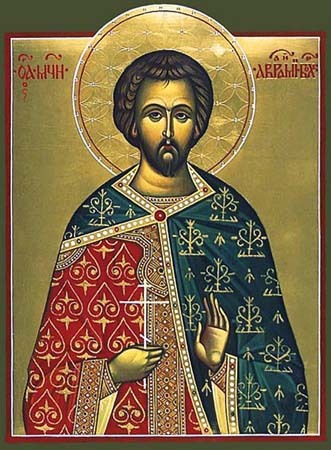 The Holy Martyr Avramii (Abraham) the Bulgar, Vladimir Wonderworker, lived during the XIII Century, and was descended from the Kamska Bulgars and brought up in Mahometanism. He was good and kindly towards the destitute, and when the Lord enlightened him with the Light of reason, he accepted Christianity. In the city of Bolgara, on the lower stretches of the Volga, Saint Avramii began to preach to his fellow countrymen about the True God. They seized hold of him and tried to force him to renounce Christ, but the saint remained firm in his confession. They tortured the martyr fiercely and for a long while, but he endured everything with an unshakable patience. On the day of 1 April 1229 they quartered the holy Martyr Avramii, and then cut off his venerable head. Russian Christians living in the city buried the remains of the saint in the Christian cemetery. On 6 March 1230, the relics of Saint Avramii were transferred by the Vladimir Great-prince Saint Georgii Vsevolodovich (Comm. 4 February) to the Uspenie (Dormition) cathedral of the Knyaginin (Princess) monastery. And from that time began celebration of his memory.